Hello! 2 days till Christmas, weeeee!!! 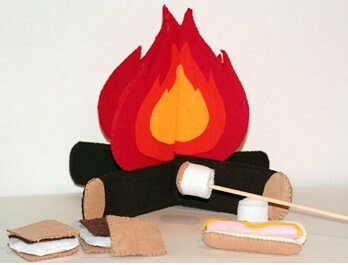 Did you guys have a good Solstice celebration? We were so bummed to miss the eclipse, too many clouds here in Seattle. Our Solstice celebration was nice and mellow. Ben and I made treats for friends and family (peppermint bark and pumpkin-chocolate muffins, yum!). By the afternoon, I was stretched too thin between the 2 kiddos to make our usual bird treats, but we have the pine cones, peanut butter and bird seed ready to go and awaiting a free moment, which I'm sure we will get over the holiday weekend. (It's too warm here to make those suet cakes, bummer!) And my favorite part: the hubby made his "traditional" mushroom over polenta dinner, SO good! I am so thankful for the Solstice and this time of rebirth. Yay for days getting longer! 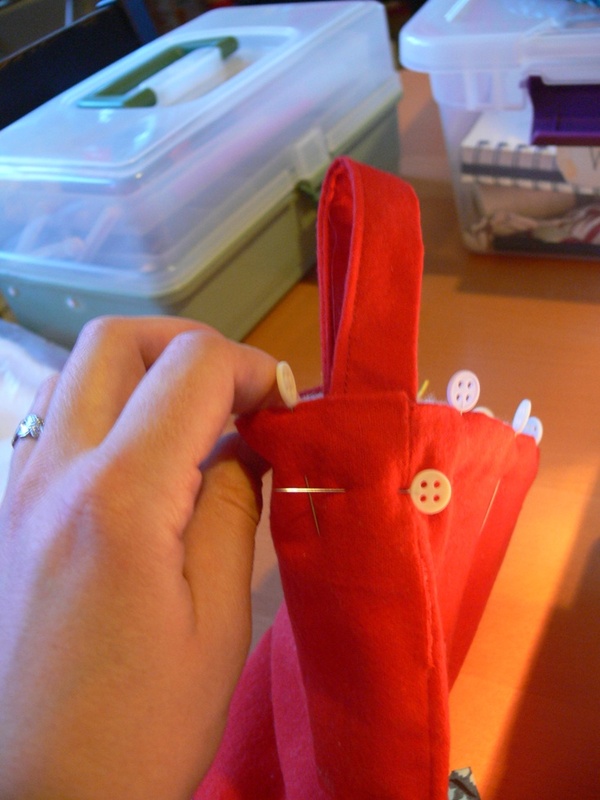 I am tired of sewing in darkness and of my pictures being so dull, ha ha. But, moving on... I wanted to show you the ONE project I've been able to complete in the last two weeks: Henry's stocking. 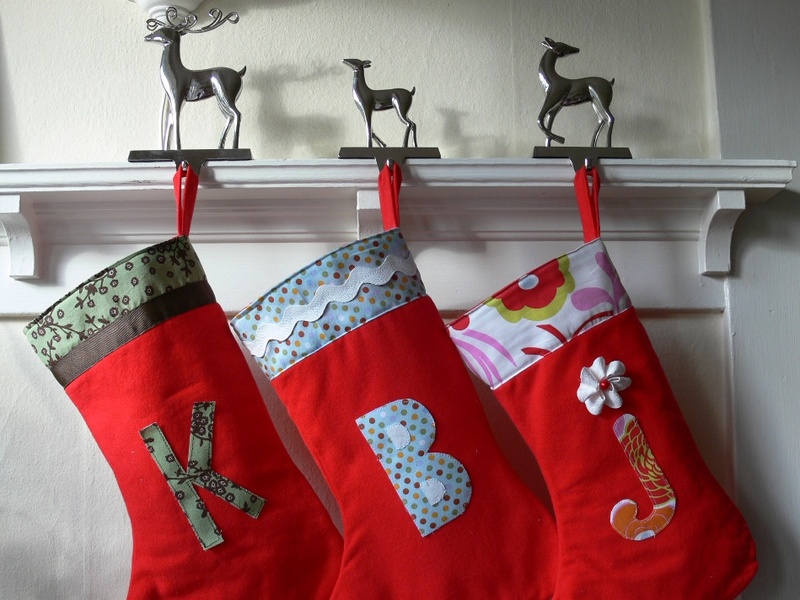 Do you remember how I embellished some basic red stockings for our family last year? 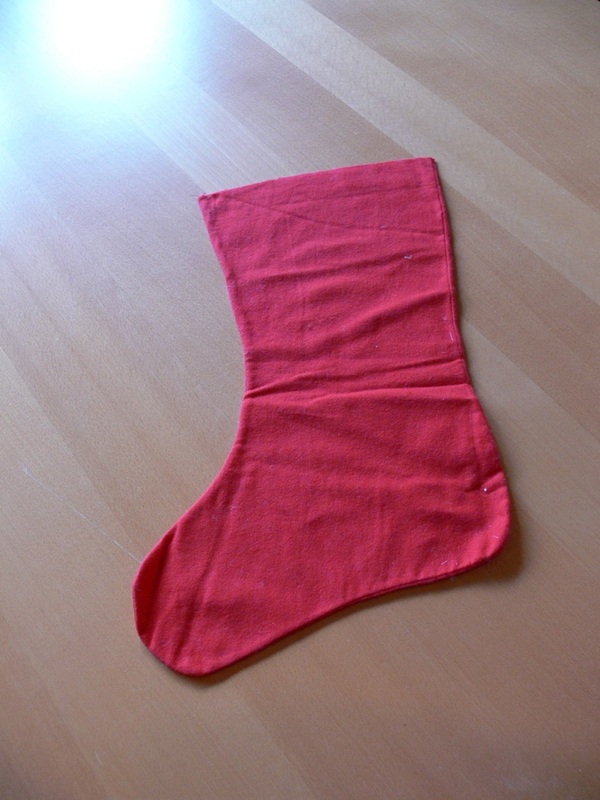 I had made an extra basic red stocking back then, so I dug it out of my crammed WIP box to finish for Henry this year. It didn't have any white fuzzy lining, so I had to make that. I only had a couple of scraps of the original fuzzy white fabric, so I used a light blue fleece to make the rest of the lining... Using what's in the stash! The white is at the top to look consistent with the other stockings, and the blue fills out the stocking on the bottom. For the embellishment, I decided to do something patchwork-y and blue. 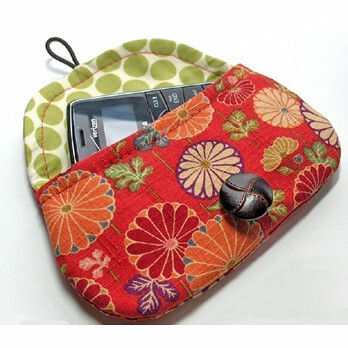 I used scraps of those lovely fabrics I have used several times in the past. I think it turned out pretty cute. 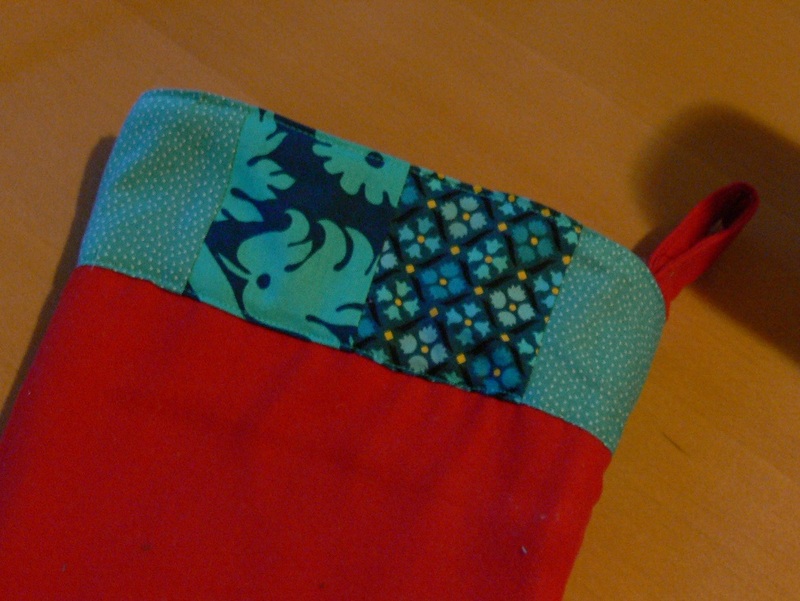 I attached the patchwork at the top of the stocking by top-stitching at the top and bottom of the patchwork band. I won't show you the back because it's a horrendous mess. And like last year, I taped (gasp!) 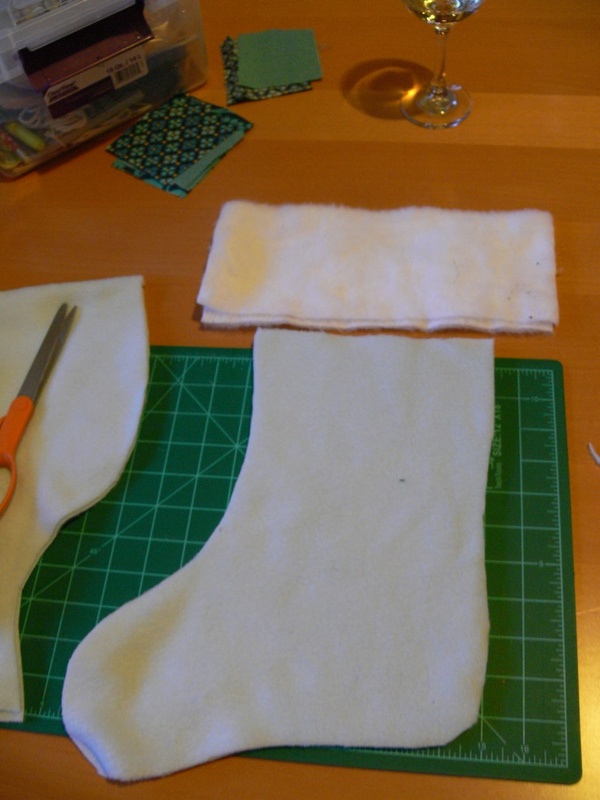 the letter onto the front of the stocking because I still need to purchase some fabric glue. Maybe I will do that before the stockings come out of storage next year... In any case, we now have 4 stockings hung up, just in time for Santa to come pay us a visit! Hey Jenny! I went to a friend's house two weeks ago for a crafting party, and noticed this lovely wreath on her front door. Turns out, she made it herself after seeing a similar wreath out and about, AND she has a blog post showing how she did it! I think this wreath would be a great hostess gift or last minute present, so here is the link! 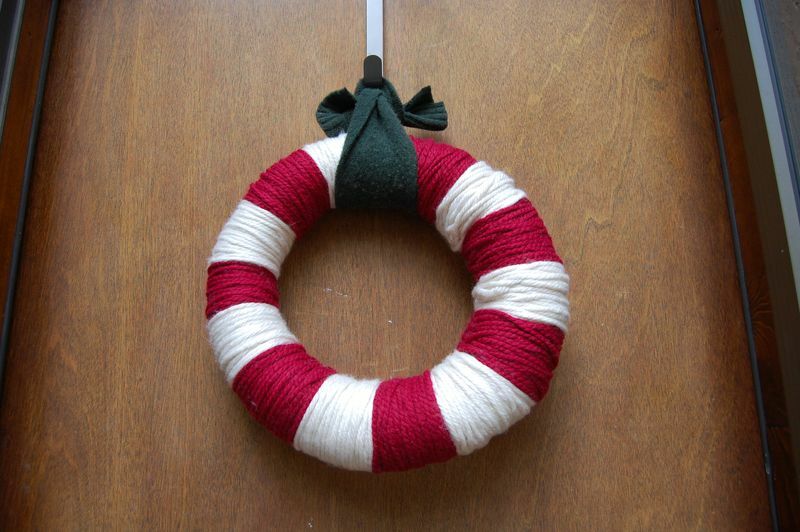 I'm not sure I have the time to make one of these myself before Christmas, but it would look great in any color combination for the rest of the year as well! 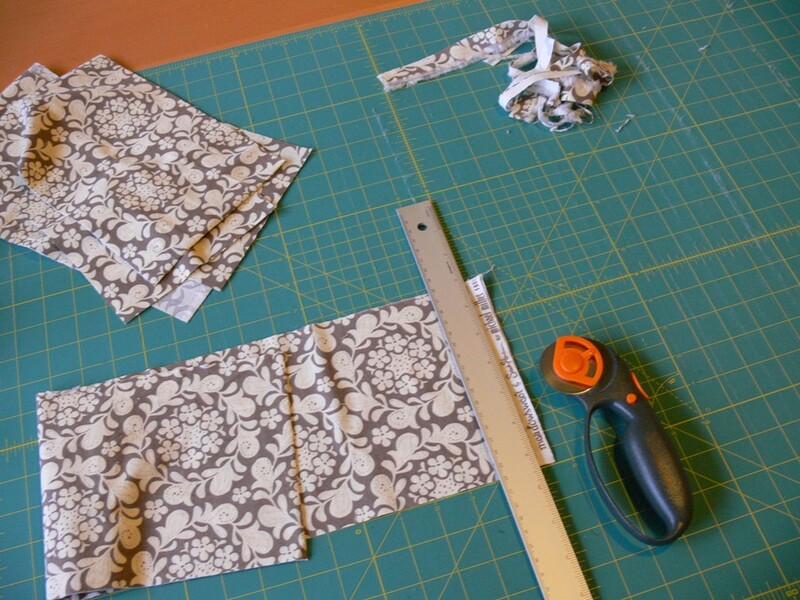 Guest Post: ShisoMama's child sized apron tutorial! 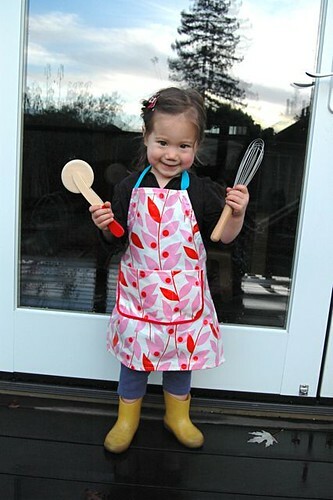 Readers, we are so lucky today: Mimi from ShisoMama just sent us a fabulous guest post, a tutorial for a child's apron! 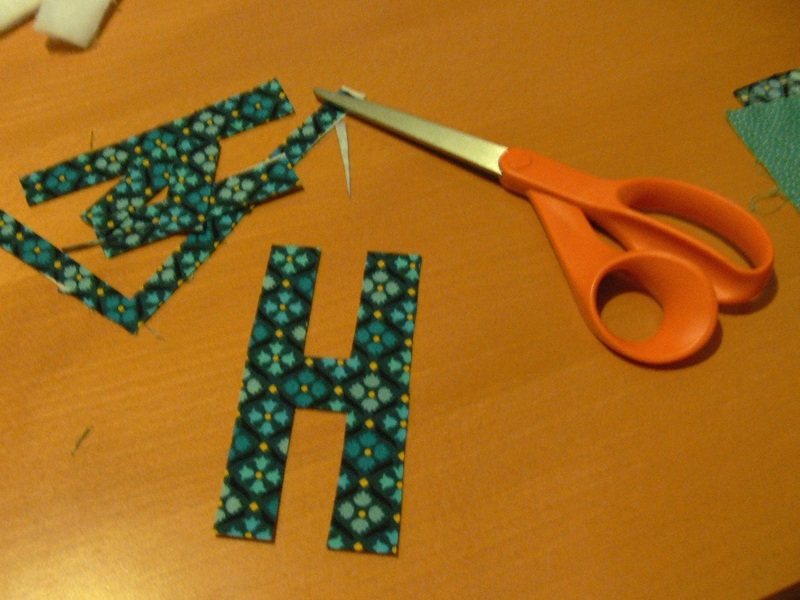 This is a perfect last minute Christmas gift idea, especially if you have some experience sewing and have the supplies on hand already. If you aren't familiar with her blog (and I am sure that lots of you out there already are!) be sure to check it out, as well as her wonderful shop. Whew! The 3-year-old is napping and the newborn is asleep in the carrier on my chest. A few minutes of free time, yahoo! 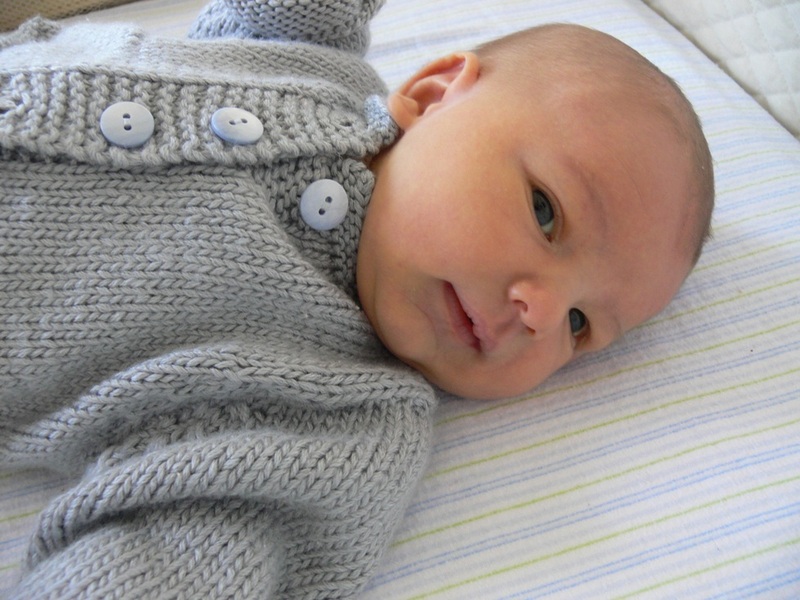 I quickly wanted to post a couple of gratuitous baby photos, but also share some lovely knits that my Mom made for Henry. As you know, Yaya is super productive when it comes to knitting and sewing. 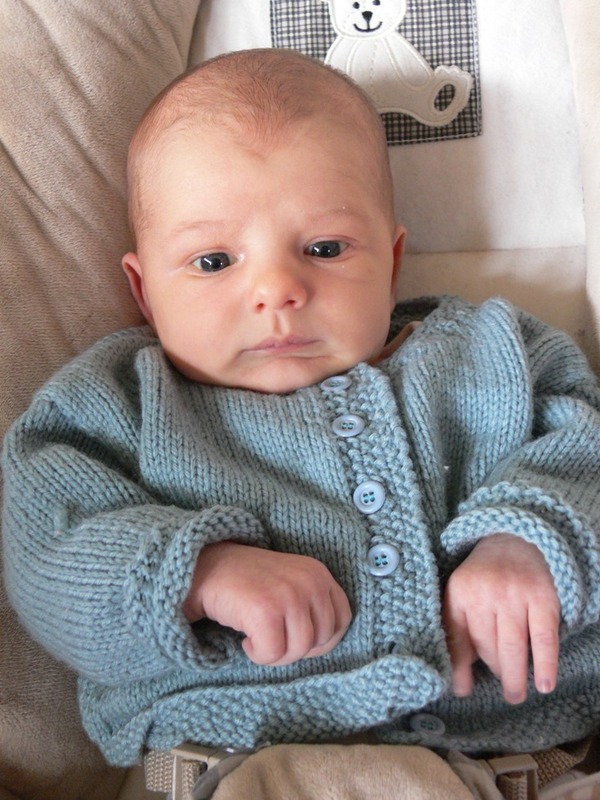 Not only did she make Ben 3 awesome sweaters for the winter, when she arrived in Seattle a few days before Henry's birth, she had knitted 2 adorable little cardigans to welcome him. They're both still a tiny bit big but that's okay, winter hasn't officially started yet! Here's the first one, a lovely grey. That's Henry at 9 days old. And here's the second one, a sweet blue-green. Do you recognize the pants? 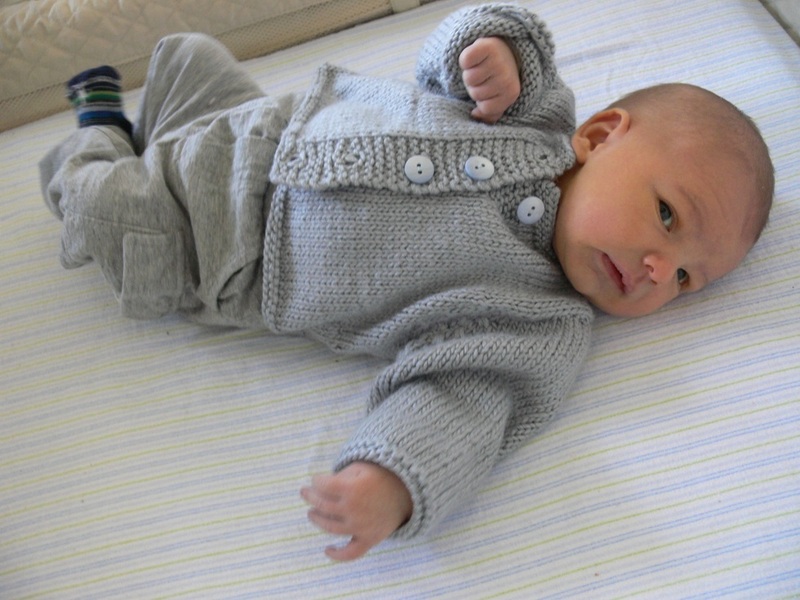 I love dressing Henry in Silas' clothes, it makes me think of you guys through the day! This is Henry at 18 days old. It's crazy to see how much he's grown already! I can't wait for him to start smiling, these newborn photos are a bit too serious. 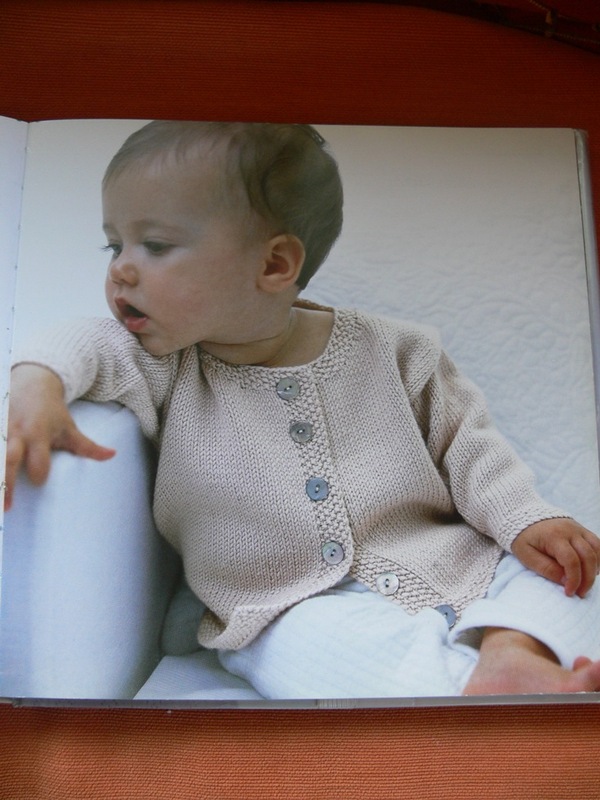 I believe the pattern for at least one of these cardigans is from Debbie Bliss's Baby Knits for Beginners. Here's a photo from the book. Maybe Yaya can chime in in the comments and correct me if I'm wrong. I have a project of my own that I recently made from that book that I will try and post soon. I am itching to start a new knitting project but am short on time and energy these days. 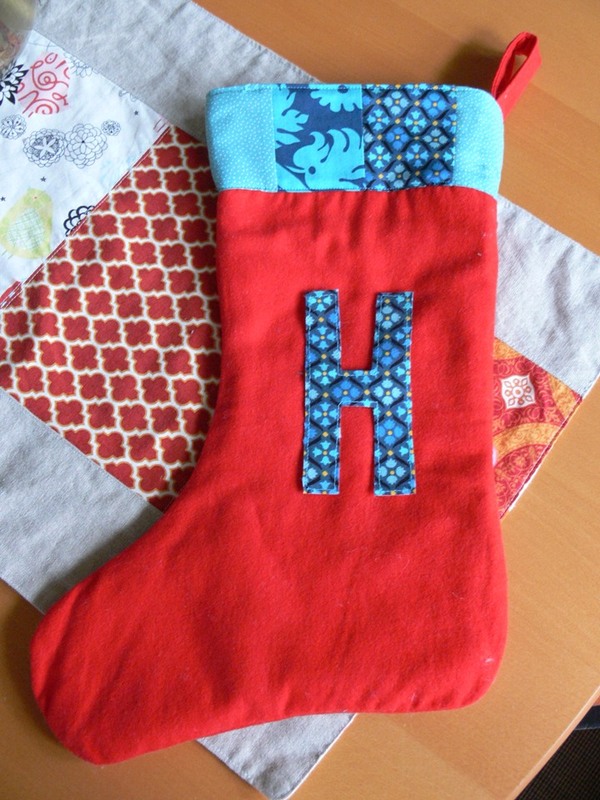 All right, I'm off to try and finish Henry's stocking before my 2 little dudes wake up. 3-2-1 GO! Jenny, Henry is the most beautiful baby I've ever seen! He's just perfect. 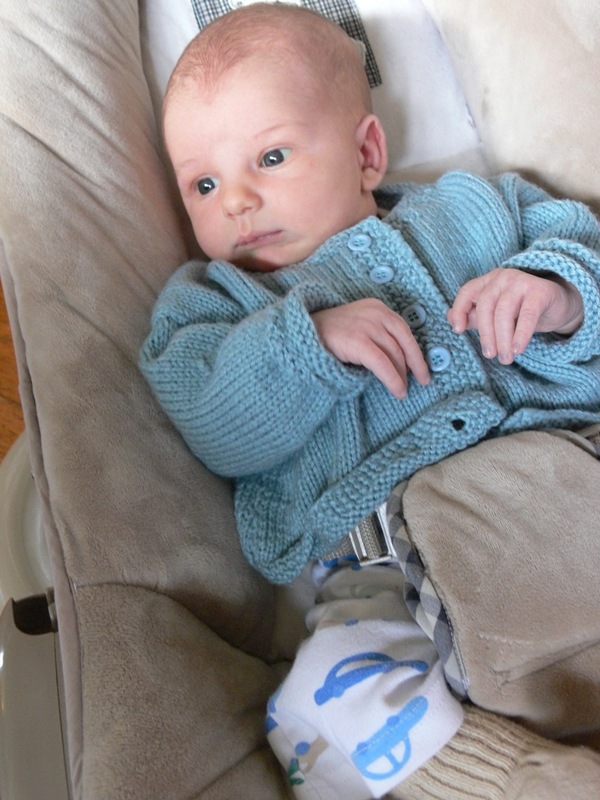 The sweater you knit for Silas last year still fits, and I love it so much. I'll be sure to post a picture soon! These two sweaters are definitely going in the "to do" file. I've got a batch of Cinnamon Pine Cones hanging in a bag as I type! I've got a pile of sticks on the porch waiting to be turned into kindling bundles! These suet cakes are on my list for our Solstice celebration. I have a reproducing cactus (it forms tiny little plants with roots hanging down on its tips, they drop into the soil around the "mama" cactus and start growing right away!) with lots of babies I'd planned to give to friends this year, similar to what is in this post about giving living plants to friends. And I have just the right box to make one of these Nature Shadowboxes, although I might have to keep it for us instead of gifting it! Oh, the horror of a coffee bean shortage when you're stuck at home on a snow day!! How was that recycled coffee?? I hope you all are enjoying the snow day (at least you're not past your due date and desperate for the roads to clear, ha!). 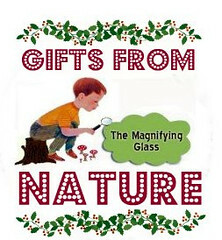 Thanks for writing about The Magnifying Glass, I did not know of this blog and it is wonderful! I really like all the ideas to which you linked. I think we're going to make those suet cakes for Solstice as well! I also love those little pinecone elves, how fun are they?! Aside from my blog browsing last Friday, I haven't really done much internet surfing lately and haven't seen any ideas for gifts made from nature. I hope our readers will comment if they have good stuff to share! Thank you to all our lovely readers who participated in our first sponsored giveaway this week. Magpie Patterns generously offered a $20 gift certificate to their shop. 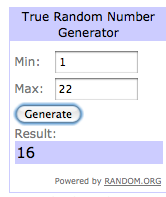 And the lucky winner is... outside 'z' box! Congratulations! Please email us at stumblesstitches (at) ymail (dot) com so we can coordinate the delivery of your winnings! Thanks again to everyone who participated. Stay tuned for more giveaways coming up soon! 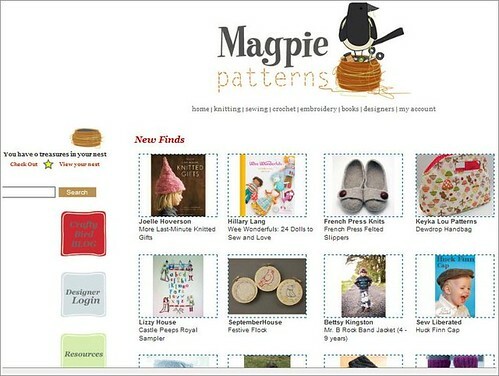 And make sure to check out Magpie Patterns for lovely patterns (for those last minute Christmas gifts!!) 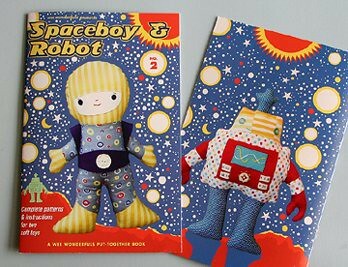 and a fab selection of crafty books. Hello there! I've been doing a lot of blog browsing today while nursing my little piglet... I mean, newborn baby boy. Goodness, this baby can eat and he's got the cheeks to show for it! And I've got a bunch of Christmas-y links to share. 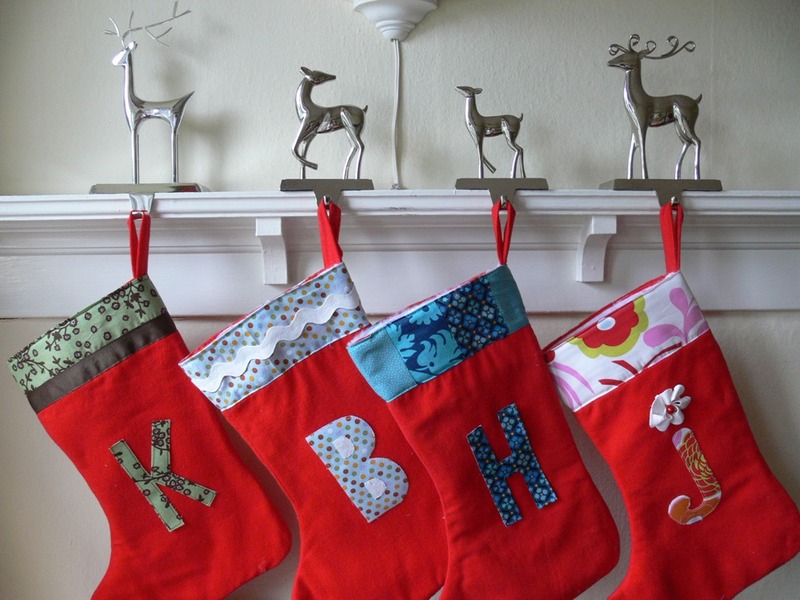 I'm inspired, even though I don't think I will have any time to do any Christmas crafts or sewing. I don't even know if I'll have my Christmas shopping done in time... Flying by the seat of our pants, we are, this holiday season. - Betz White has been doing a great series of Holiday Hints and I liked her "Comfort and Joy" post. - Bluebird Baby wrote about celebrating St. Nicholas and it brought back a bunch of memories for me. I attended Catholic school in France during my childhood, and every year on St. Nicholas day, we each received an orange and baby Jesus-shaped brioche. - The Crafty Crow has been posting all kinds of ornaments and Christmas-y crafts. I liked her post about Christmas cards kids can make. - Allison at Cluck Cluck Sew made the cutest stockings ever! 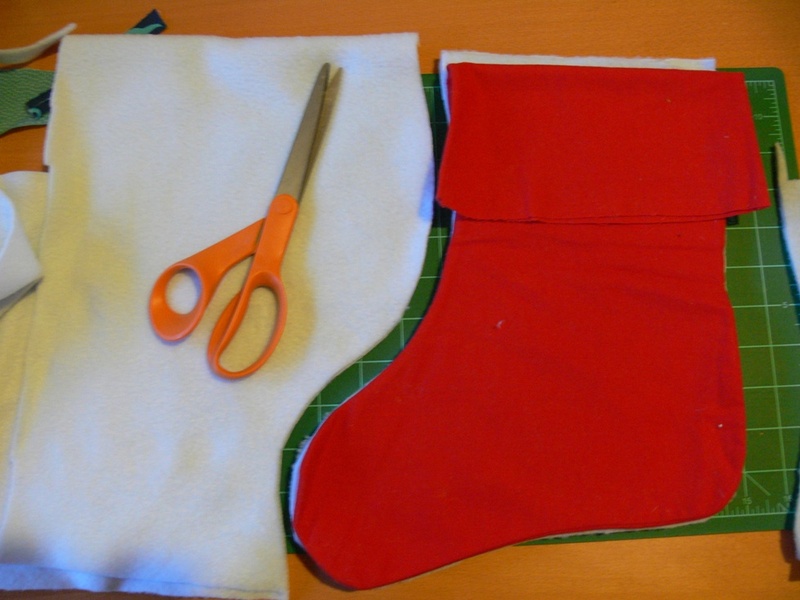 And she also wrote a tutorial for making a lined stocking with cuff. 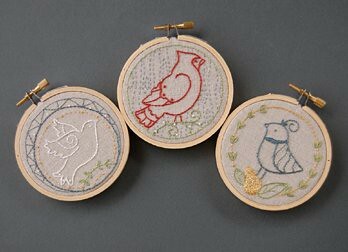 - Check out these embroidery hoop ornaments by Melanie at the Crafty Cupboard. - Dana from Made put together these sweet monogrammed ornaments out of felt, and posted a tutorial for making them. There is so much more out there, but this will do for now! I hope everyone is enjoying the crazy holiday prep! 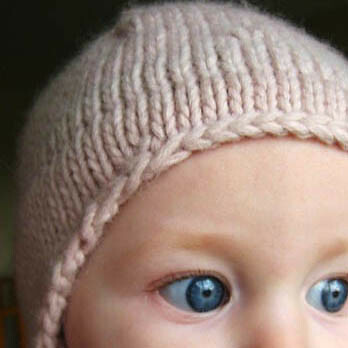 Only a few hours left to enter the giveaway by sponsor Magpie Patterns! Click here to go read the post and leave a comment for a chance to win a $20 gift certificate. Don't forget to leave another comment if you like Magpie Patterns on Facebook, for a second chance to be entered. I'm sure that Silas will have tons of fun pulling on the necklace. 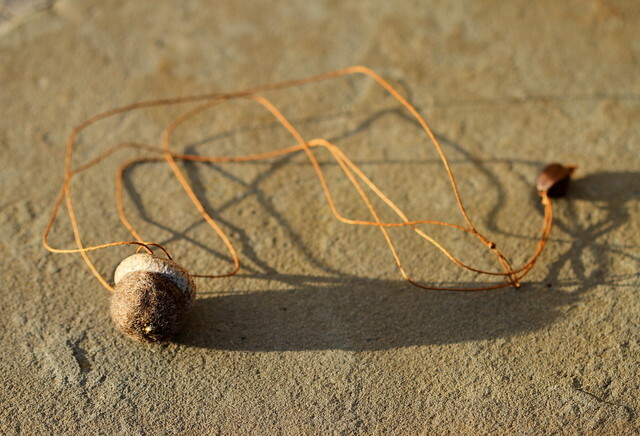 Just so you know, the acorn is hung with hemp - I thought you'd like that! I sawed the leaf out of copper and then hammer stamped the veins. It was so much fun to make! I feel so lucky to know so many creative people, Becky is a real role model for me. With two boys of her own that are a bit older than my two I've gotten a lot of inspiration watching her move from staying at home full time with babies/toddlers to becoming a jewelry designer and a photographer now that both her boys are in school. 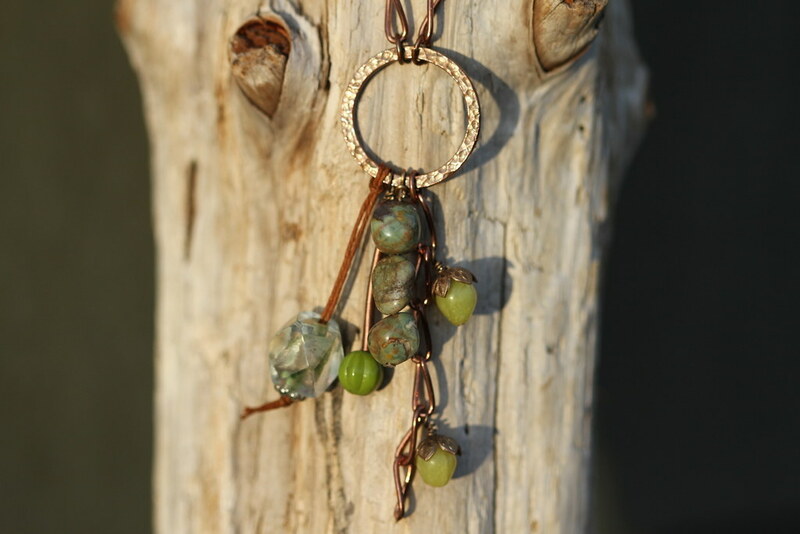 I can't resist posting another photo of another necklace she has in her shop, the "Eat, Pray, Love" inspired necklace. It is gorgeous! And readers, don't forget our contest this week! 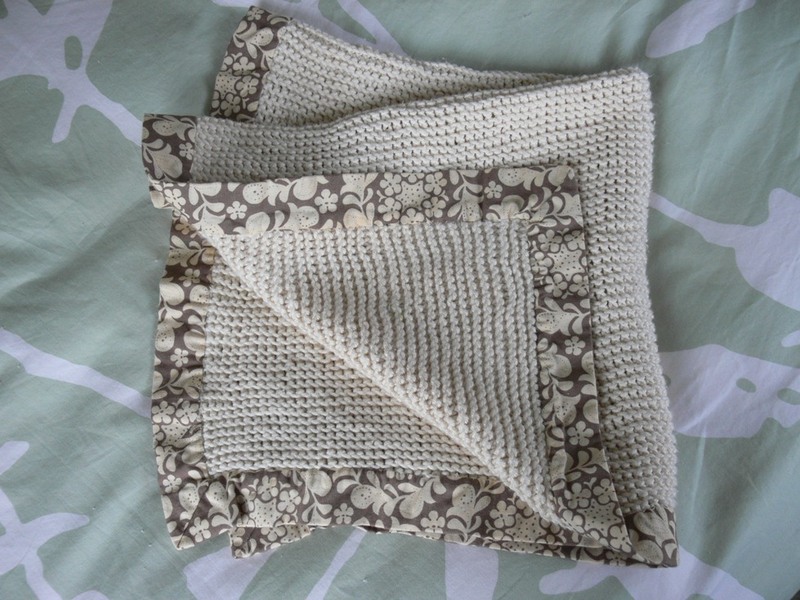 Go to this post to enter into our drawing for a $20 gift certificate for Magpie Patterns. You can read the rules and get a discount code for the shop, all in the post from Monday! 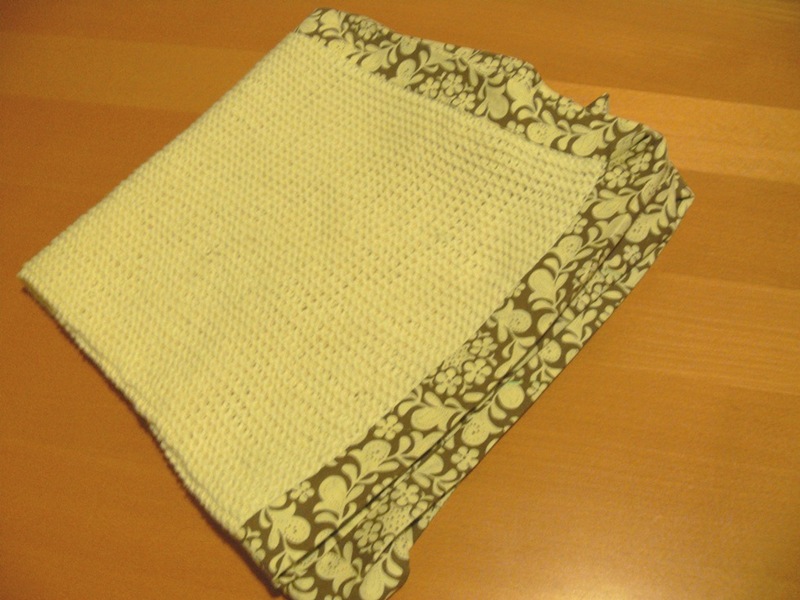 Just before Henry was born, I was able to finish the knitted baby blanket on which I had frantically been working. I think I might have finished knitting it just on, or even after my due date! Fortunately, the little dude was 6 days "late" and I was also able to add the border before he arrived. 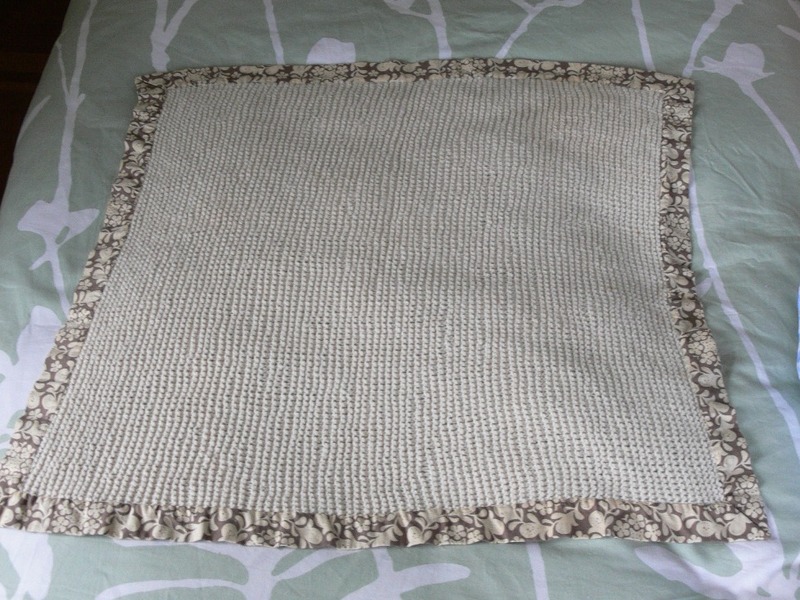 I washed the blanket before adding the border. 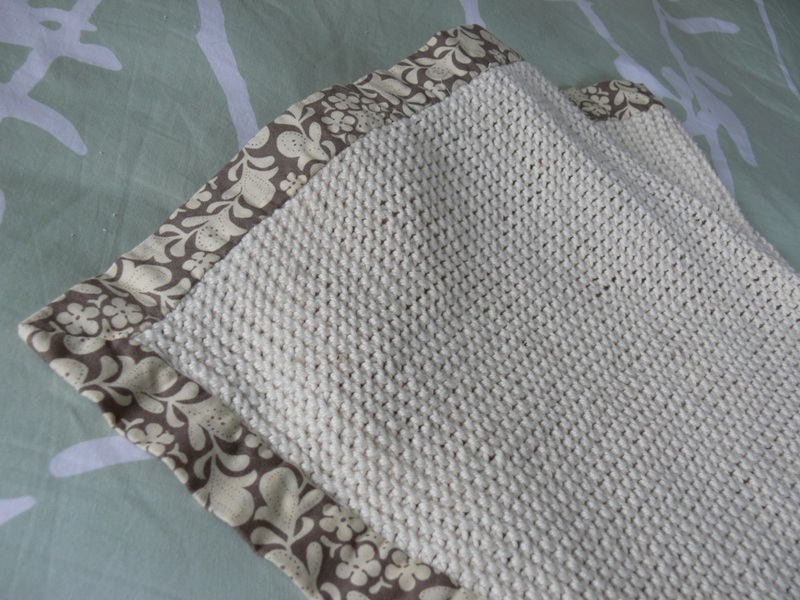 Since I used cotton yarn, washing the blanket shrunk the size quite a bit, but it also made the stitches thicker and more even, giving the blanket a thick and luxurious feel. The final size was about 22 x 24 inches. You may remember I was debating what kind of fabric to use for the border. 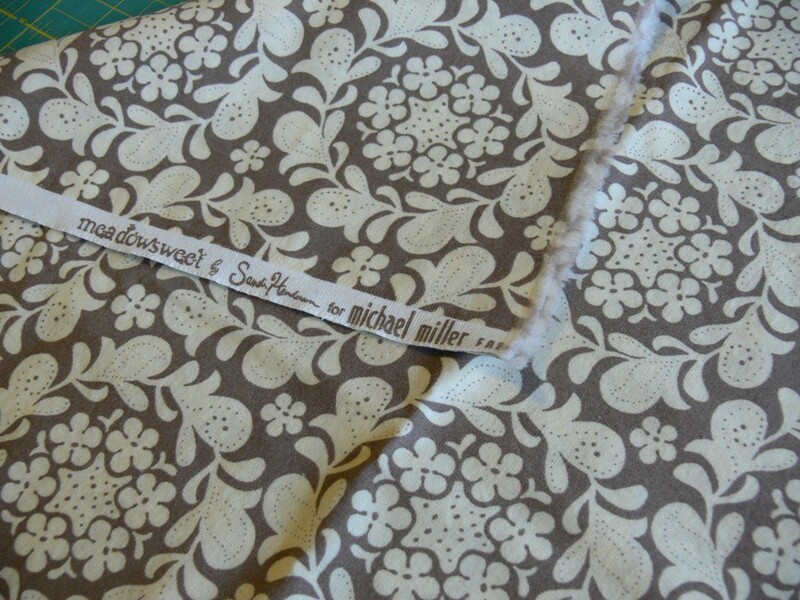 I visited my local fabric store and fell in love with this cream and brown print from the Meadowsweet collection by Sandi Henderson for Michael Miller. 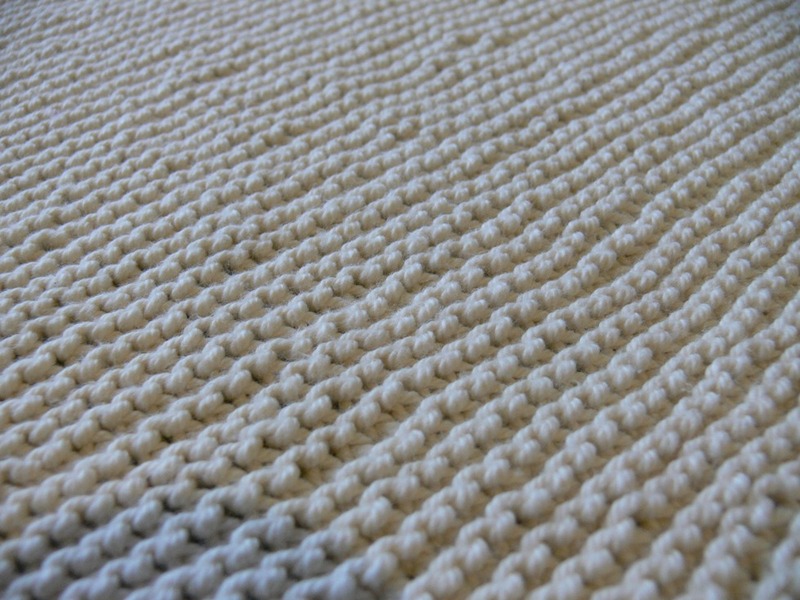 The cream color matched the yarn of the blanket exactly. I had JUST enough with 1/2 yard, should have probably bought a tiny bit more. 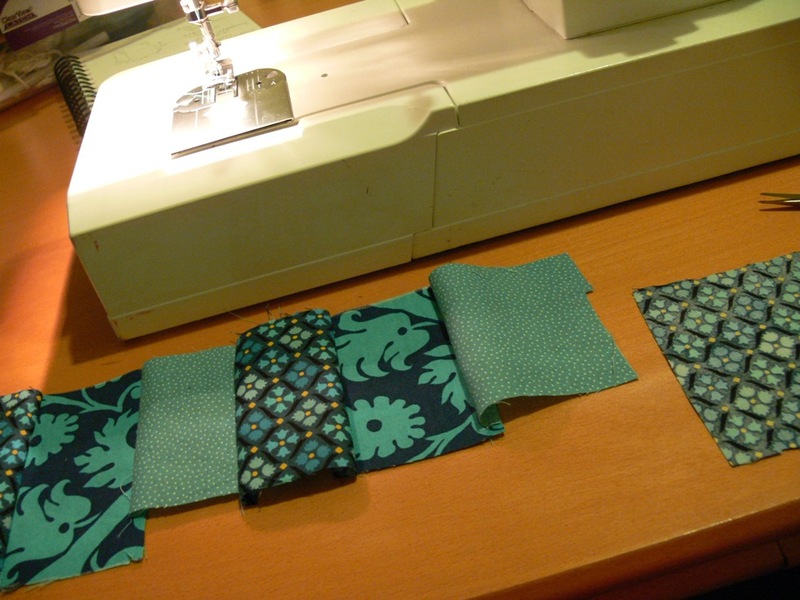 I cut the fabric in 6.25 inch strips and assembled them with diagonal seams so that I ended up with one long strip. I folded and pressed it in half length-wise. 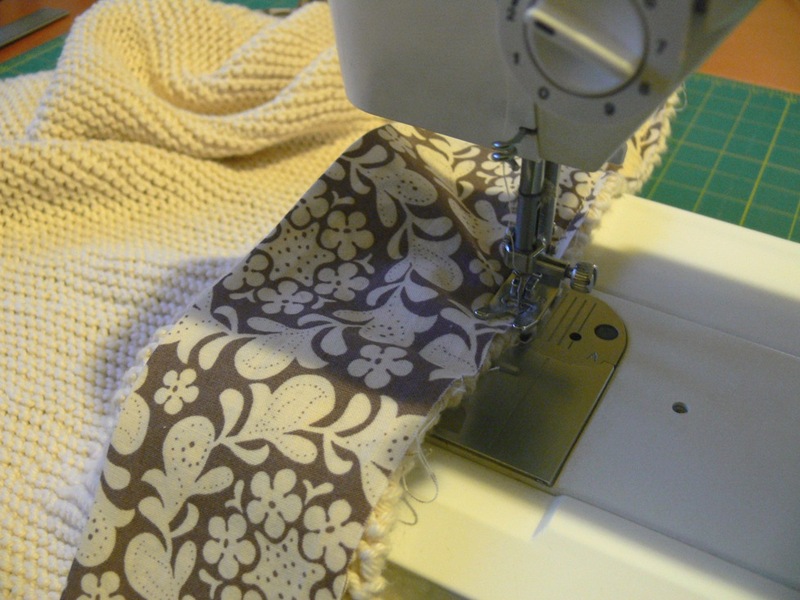 I then pinned the raw edge along the blanket and sewed the border onto the blanket with the sewing machine. I used the Juicy Bits tutorial to figure out the corners. 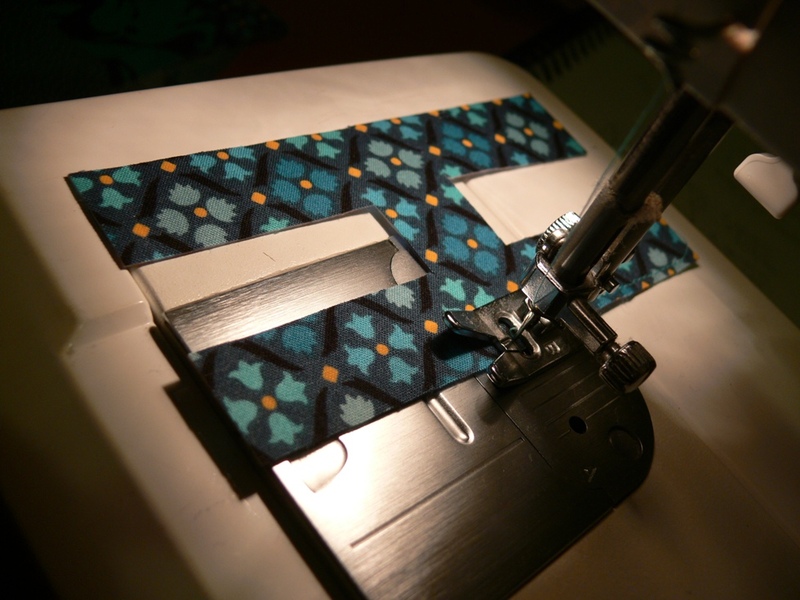 I then stitched the flip side of the border over the seam by hand. 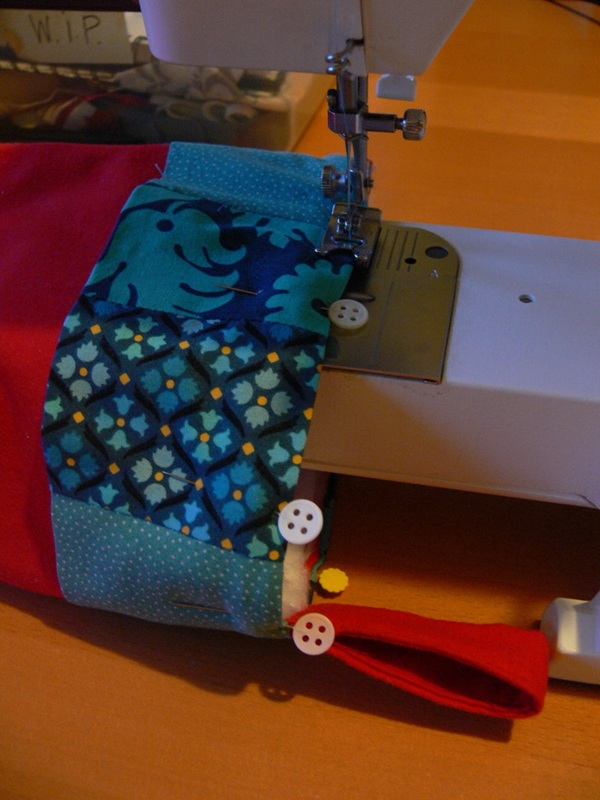 I didn't want to deal with the sewing machine not catching both layers and having to undo my stitches multiple times, especially with the tricky corners. Stitching by hand took a bit longer but it was a much more peaceful process. 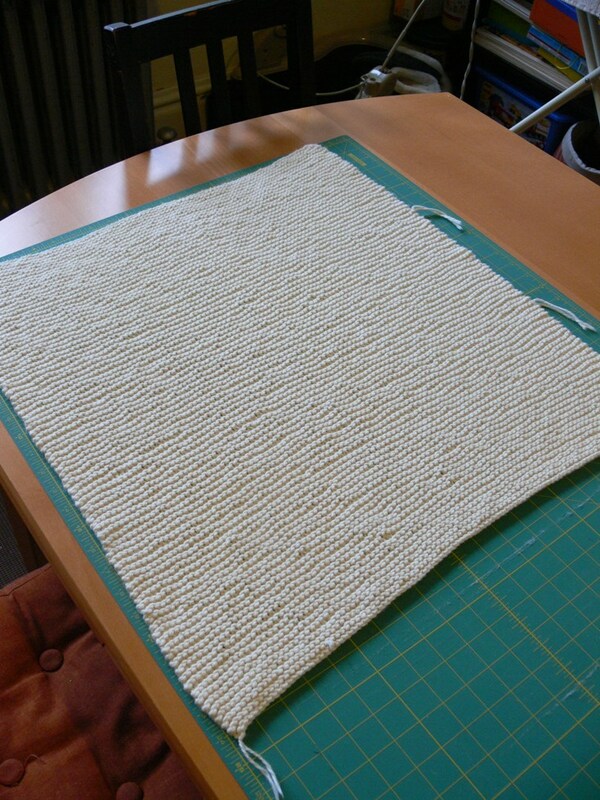 My blind stitches are not exactly "blind", but close enough. I also blind-stitched the mitered corners "closed". After washing it again, the borders are a bit wavy, but whatever. I am really happy with the result. It is such a cozy, warm blanket and I've already gotten several compliments on it, including from the nurse at the clinic when we got Henry ready to go home! 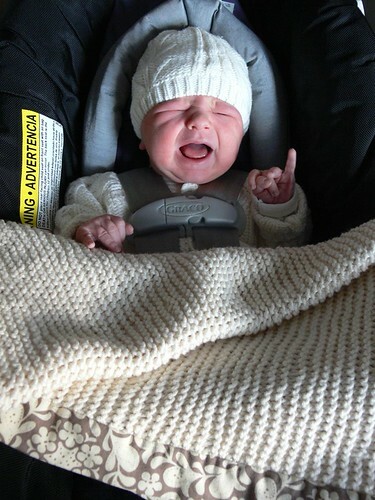 He wasn't too happy about being strapped into the carseat, but at least he was warm! It turned out great! I love the fabric. It goes great with the natural colored yarn. When I am off my "supply fast" I am going to KnitPicks to buy some of that yarn! I have to say that I am a little sad reading this post, knowing that Henry is going to be a lot bigger by the time I get to see him in person! He is so, so, so sweet! Also, don't forget our giveaway! 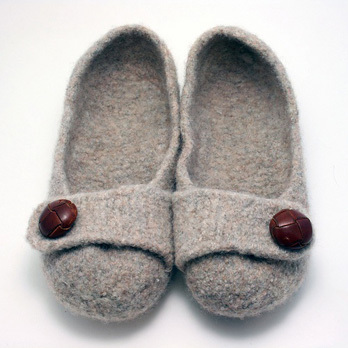 Magpie Patterns is offering one winner a $20 gift certificate to their shop. Contest ends Friday, December 10th! Go HERE to read the giveaway guidelines and to enter! 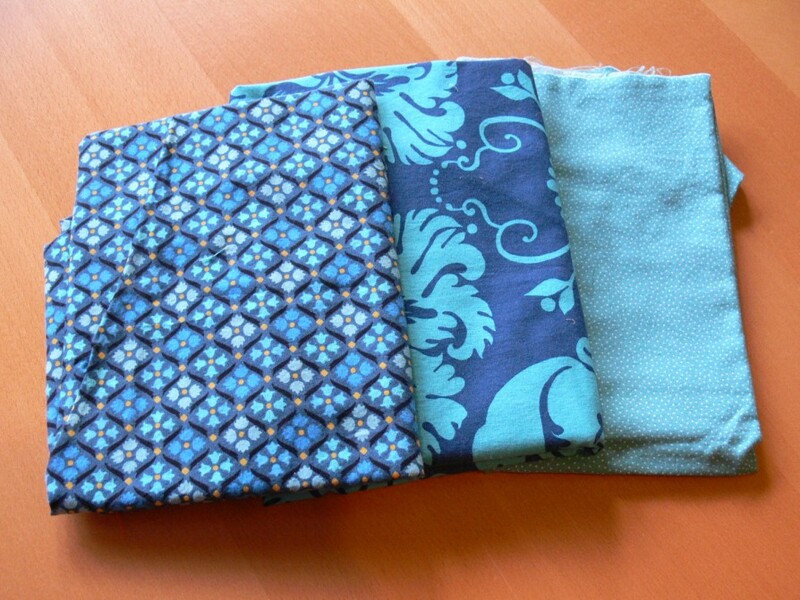 Magpie Patterns: Introduction and Giveaway! 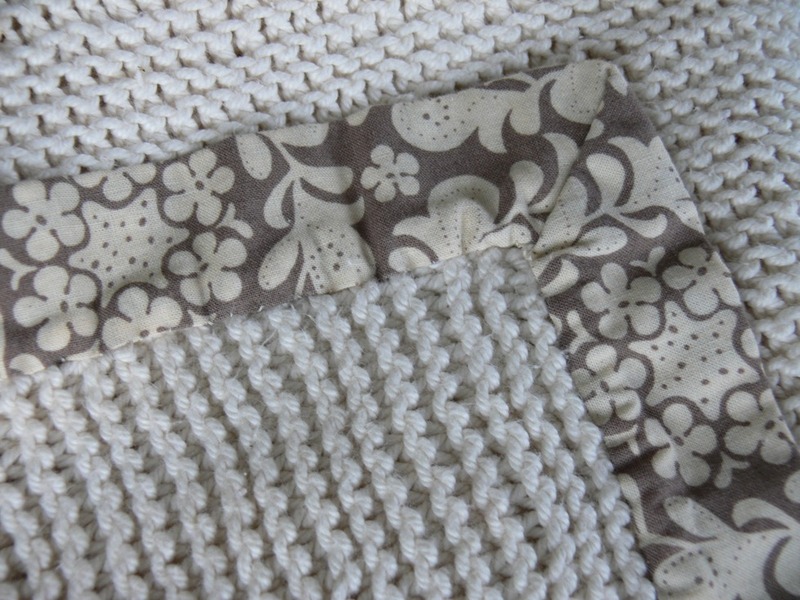 We're excited to introduce you to a new Stumbles & Stitches sponsor: Magpie Patterns! Let me start out by saying that I look at a lot of independent online shops, and there are a few things that stand out to me when I visit a site for the first time. First, how does the site look and how easy is it to use? I need form and function, a beautiful site that is easy to order from and browse, that's organized in a way that makes sense to me. Secondly, does the site have a well curated selection of items? And third, what do I know about the person running this small business? I like knowing that my purchase is helping someone that I would like to sit down with for a cup of coffee. To enter, go visit Magpie Patterns and take a look around (you might find some FREE PDFs while you are looking around, I noticed quite a few during my own visits the last couple of weeks). Then come back here to post a comment about your favorite pattern or book. For an extra chance to win, "Like" Magpie Patterns on Facebook, and post another comment here that you've done so! That is 2 chances per person to enter the giveaway. Make sure to include contact info in your comment, like a blog link or email address. We'll accept entries through midnight on Friday 12/10. And we'll announce the winner on Saturday, 12/11. Good luck! Congratulations to V! You've won our Magpie Patterns Giveaway. Email us so we can connect you with Magpie!